Leader of the rational Ḥasidim called "ḤaBaD" (acrostic formed from "Ḥokmah," "Binah," "De'ah" = "Wisdom," "Understanding," "Knowledge"); born at Liozna, government of Moghilef, in 1747; died at Pyen, near Kursk, and interred at Gadiyoch, government of Poltava, Dec. 28, 1812. Little is known of that part of Shneor Zalman's life which preceded his conversion to Ḥasidism. 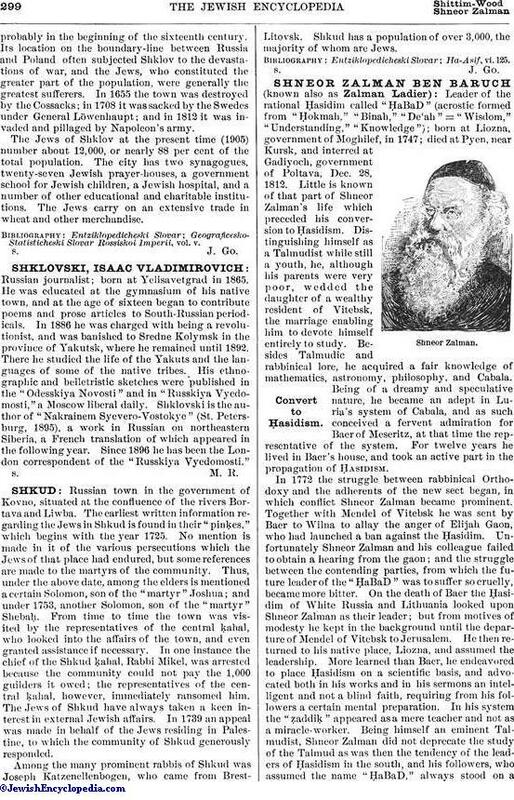 Distinguishing himself as a Talmudist while still a youth, he, although his parents were very poor, wedded the daughter of a wealthy resident of Vitebsk, the marriage enabling him to devote himself entirely to study. Besides Talmudic and rabbinical lore, he acquired a fair knowledge of mathematics, astronomy, philosophy, and Cabala. Being of a dreamy and speculative nature, he became an adept in Luria's system of Cabala, and as such conceived a fervent admiration for Baer of Meseritz, at that time the representative of the system. For twelve years he lived in Baer's house, and took an active part in the propagation of Ḥasidism. In 1772 the struggle between rabbinical Orthodoxy and the adherents of the new sect began, in which conflict Shneor Zalman became prominent. Together with Mendel of Vitebsk he was sent by Baer to Wilna to allay the anger of Elijah Gaon, who had launched a ban against the Ḥasidim. Unfortunately Shneor Zalman and his colleague failed to obtain a hearing from the gaon; and the struggle between the contending parties, from which the future leader of the "ḤaBaD" was to suffer so cruelly, became more bitter. On the death of Baer the Ḥasidim of White Russia and Lithuania looked upon Shneor Zalman as their leader; but from motives of modesty he kept in the background until the departure of Mendel of Vitebsk to Jerusalem. He then returned to his native place, Liozna, and assumed the leadership. More learned than Baer, he endeavored to place Ḥasidism on a scientific basis, and advocated both in his works and in his sermons an intelligent and not a blind faith, requiring from his followers a certain mental preparation. In his system the "ẓaddiḳ" appeared as a mere teacher and not as a miracle-worker. 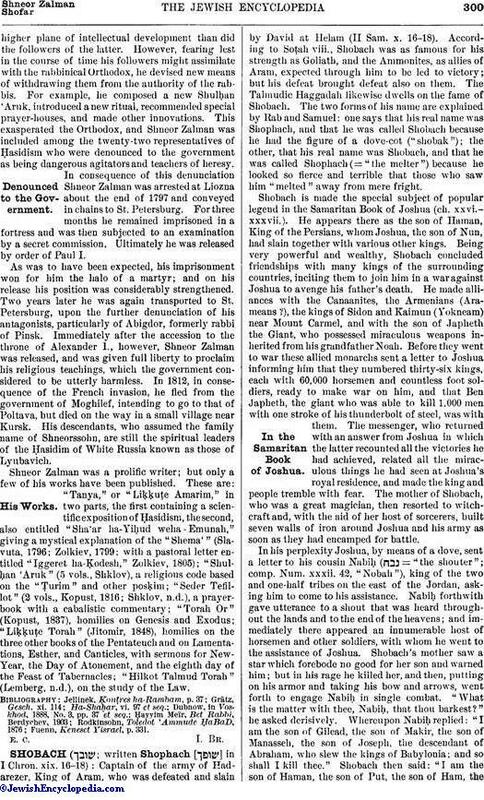 Being himself an eminent Talmudist, Shneor Zalman did not deprecate the study of the Talmud as was then the tendency of the leaders of Ḥasidism in the south, and his followers, who assumed the name "ḤaBaD," always stood on ahigher plane of intellectual development than did the followers of the latter. However, fearing lest in the course of time his followers might assimilate with the rabbinical Orthodox, he devised new means of withdrawing them from the authority of the rabbis. For example, he composed a new Shulḥan 'Aruk, introduced a new ritual, recommended special prayer-houses, and made other innovations. This exasperated the Orthodox, and Shneor Zalman was included among the twenty-two representatives of Ḥasidism who were denounced to the government as being dangerous agitators and teachers of heresy. In consequence of this denunciation Shneor Zalman was arrested at Liozna about the end of 1797 and conveyed in chains to St. Petersburg. For three months he remained imprisoned in a fortress and was then subjected to an examination by a secret commission. Ultimately he was released by order of Paul I. As was to have been expected, his imprisonment won for him the halo of a martyr; and on his release his position was considerably strengthened. Two years later he was again transported to St. Petersburg, upon the further denunciation of his antagonists, particularly of Abigdor, formerly rabbi of Pinsk. Immediately after the accession to the throne of Alexander I., however, Shneor Zalman was released, and was given full liberty to proclaim his religious teachings, which the government considered to be utterly harmless. In 1812, in consequence of the French invasion, he fled from the government of Moghilef, intending to go to that of Poltava, but died on the way in a small village near Kursk. His descendants, who assumed the family name of Shneorssohn, are still the spiritual leaders of the Ḥasidim of White Russia known as those of Lyubavich. Shneor Zalman was a prolific writer; but only a few of his works have been published. These are: "Tanya," or "Liḳḳuṭe Amarim," in two parts, the first containing a scientific exposition of Ḥasidism, the second, also entitled "Sha'ar ha-Yiḥud weha-Emunah," giving a mystical explanation of the "Shema'" (Slavuta, 1796; Zolkiev, 1799; with a pastoral letter entitled "Iggeret ha-Ḳodesh," Zolkiev, 1805); "Shulḥan 'Aruk" (5 vols., Shklov), a religious code based on the "Ṭurim" and other posḳim; "Seder Tefillot" (2 vols., Kopust, 1816; Shklov, n.d.), a prayer-book with a cabalistic commentary; "Torah Or" (Kopust, 1837), homilies on Genesis and Exodus; "Liḳḳuṭe Torah" (Jitomir, 1848), homilies on the three other books of the Pentateuch and on Lamentations, Esther, and Canticles, with sermons for New-Year, the Day of Atonement, and the eighth day of the Feast of Tabernacles; "Hilkot Talmud Torah" (Lemberg, n.d.), on the study of the Law. Fuenn, Keneset Yisrael, p. 331.